In Living in a Mindful Universe, the New York Times bestselling author of Proof of Heaven and The Map of Heavenshares his insights into the true nature of consciousness. Embracing his radically new worldview, he began a committed program of personal exploration into nonlocal consciousness. Along the way, he met Karen Newell, who had spent most of her lifetime living the worldview he had only just discovered was possible. Her personal knowledge came from testing various techniques and theories as part of her daily routine. With Living in a Mindful Universe, they teach you how to tap into your greater mind and the power of the heart to facilitate enhancement of healing, relationships, creativity, guidance, and more. Using various modalities related to meditation and mindfulness, you will gain the power to access that infinite source of knowing so vital to us all, ultimately enriching every facet of your life. Eben Alexander, MD, was an academic neurosurgeon for over 25 years, including 15 years at the Brigham & Women’s Hospital, Children’s Hospital, and Harvard Medical School in Boston, with a passionate interest in physics and cosmology. He is the author of the #1 New York Times bestseller Proof of Heaven and The Map of Heaven. Karen Newell is a life-long seeker of esoteric wisdom and has amassed a wealth of firsthand experience exploring realms of consciousness. She is the cofounder of Sacred Acoustics, an innovator in the emerging field of brainwave entrainment audio recordings used to help listeners reach transcendental states of awareness. While eloquently telling us about the Mindful Universe, Eben Alexander and Karen Newall skillfully and beautifully drive home a timely and important message: You are not just part of a self-aware and ever evolving universe, you are the one that gives it awareness and is evolving it! You are your universe. The authors make the compelling case that the future of our world and the future vision for our universe lies directly in our hands and in the choices we make. Eben Alexander and Karen Newell, two of the brightest and most sensitive people I know, have written a truly wonderful new book. Their book is both a personal journal of their spiritual quest and a practical manual for the care, education and nourishment of the soul. I love their brilliant, in-depth thinking and analysis, which sheds exciting new light on near-death experiences and other phenomena of the spiritual life. In this important book, Eben Alexander and Karen Newell lead us on an unforgettable journey that opens our hearts to a deeper understanding of consciousness. As a neurosurgeon previously steeped in materialism until his beliefs were shattered by a near death experience, Alexander is in a unique position of being able to provide a more comprehensive description of the true nature of reality than conventional science or spirituality can offer, which he delivers with great elegance within the pages of this book. I highly recommend this book to anyone who is interested in gaining a deeper understanding of our true nature; especially those who are not afraid of breaking down the boundaries between our scientific and spiritual beliefs. Having previously accepted the philosophy of 'scientific materialism' as the ultimate truth, Dr. Alexander found that his life-transforming near-death experience during coma had shattered all of his former beliefs about the nature of consciousness, the roles of the mind and brain, and the meaning of life and death. His emergent understanding is presented in Living in a Mindful Universe, which illuminates the many steps he took to expand his understanding of a much larger, richer, and deeper cosmos. Similar to Einstein, Eben, a man of science, delves into the Spiritual Oneness. He realizes that there are many paths up the mountain and they end up in the same place. As a result of understandings that Eben encountered during his coma, he succinctly conveys familiarity with many planes of consciousness, and the way he demonstrates this awareness is fascinating. Numerous books have been written about consciousness, mind, soul, and love, but nobody has put them together in such an ingenious way as Dr. Eben Alexander. His book Living in a Mindful Universe will bring its readers a road map for life that is desperately needed in these times of stress, conflict, and confusion. It not only deals with life after death but how to live a more meaningful existence right here and right now. Dr. Eben Alexander’s case history is one of the most important in the history of medicine. The fact that he physically survives his illness is astonishing, but his account of a journey during his coma to a resplendent domain that operates according to the principle of boundless love is even more surprising. Alexander’s experience shows that the dismal, vacuous view of materialism, which guarantees total annihilation of consciousness with physical death, is almost certainly wrong. Newell’s contributions are a valuable addition, making possible a practical blueprint by which one can realize transcendent insights and spiritual growth without experiencing the dangerous trauma of Alexander’s journey. Their collaboration makes Living in a Mindful Universe vital reading as we struggle to recover direction, purpose, and meaning in modern life. A very important book, with rich stories illustrating a world beyond the limits of materialistic science and one Neurosurgeon’s quest to rethink everything he has learned. Dr. Alexander’s humbleness, along with the wise council of Karen Newell, is a roadmap for those wishing to bridge science and spirit and enter into a life of wonder and magic. And, it’s great read! -William Arntz, creator of What the BLEEP Do We Know!? Living in a Mindful Universe is a compelling introduction to a vitally important and rapidly unfolding paradigm shift in science. It highlights the decline of a nihilistic worldview held by scientists for centuries, where consciousness was a meaningless side effect of brain activity, to the rise of a far more comprehensive worldview where consciousness is the fundamental "glue" that defines reality itself. Living in a Mindful Universe goes beyond Dr. Alexander’s previous books in showing how science and spirituality are coming together to give us a more complete understanding of consciousness, meaning,and purpose in the universe -- and in describing how we can realize our role in it. In this third book based upon his extraordinary experiences during a coma induced by bacterial meningitis, Eben Alexander provides new information about the coma and its aftermath, connects his experiences with world-wide and world-old mystical traditions, and links experiences of this sort with modern developments in physics. He then goes on with his partnerKaren Newell to survey a variety of practices and technologies that may enable others to access these expanded states of consciousness and the normally latent human potentials associated with them. Many other such possibilities undoubtedly remain to be discovered, and time will tell which of the lot work best, and for whom. An exciting new journey of scientific self-discovery is certainly underway. In Living in a Mindful Universe, Eben Alexander and Karen Newell explore the worlds of both science and spirit. They offer clear explanations of findings that challenge the Supreme Illusion of everyday physical reality, along with frank accounts of their own efforts to connect more with the Collective Mind. The result is a work filled with wisdom and compassion. I have great admiration for Dr. Eben Alexander, because he didn't ignore something that science cannot (currently) explain—namely, a detailed near-death experience when his brain was clinically dead. 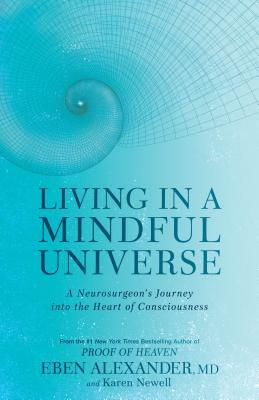 In his latest book, Living In A Mindful Universe ,he shares with us what he has discovered about the nature of human consciousness since awakening from his coma, and also gives readers tools they can use to deepen their own consciousness. Highly recommended for anyone looking to harness the power of the human mind!" With a background in neurosurgery and having had direct experience of non-ordinary aspects of reality, Eben Alexander is a unique and valuable cultural asset in our efforts to develop a more mature understanding of the nature of self and world. In this delightful and mind-opening book, Eben and Karen take us with them on their journey of exploration subsequent to Eben's NDE. They show that the insights they have had are accessible to any one of us, and that sane, coherent, non-materialist views of reality not only exist, but are no longer fringe. In this impressive book, Eben Alexander gives us a frank and very personal account of the life-changing transformation following his deep-coma experience. He shares with us his complete flip away from scientific materialism, and his newly obtained insight in the mystery of the Collective Mind. He explains the importance to make contact with this high-ordered consciousness by practicing conscious awareness on a more daily basis. Our picture of the world will change fundamentally by the insight that it is all about consciousness. This perspicuously written book will bring deeper understanding of the nature of the human spirit, and gives us all a greater knowledge about the nature of reality. Highly recommended.